To engage a limiter's gain reduction, there will usually be a dedicated input gain control: increasing this will turn up the signal, pushing it harder into the limiter. The output ceiling is a set dB value past which no audio can exceed: the highest peaks of a signal are pulled down once they reach this barrier. Raising a limiter's input gain will cause an obvious increase in level, and this louder signal will sound perceptively better in comparison to the unprocessed signal. You may be fooled into thinking the limited version is more impressive, despite actually reducing transient detail in a negative way. To maintain a balance of equal loudness, most limiters allow you to turn up the input gain and reduce the output gain by the same dB amount at the same time. This keeps the signal at the same level while limiting is applied, pulling down the peaks without any 'impressive' gain increase. It's then easy to bypass the limiter and judge the peak reduction at equal level. Now let's walk through the process of limiting a drum kit. For more on limiting, get Future Music 293, which is on sale now. Step 1: The snare hit in our example 909 drum kit is particularly sharp and spiky. We'll use an oscilloscope plug-in to view the snare's waveform in real time, meaning we can visually monitor the effect of any limiting treatments and subsequent transient reduction. 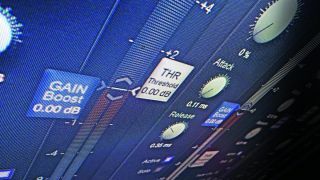 Step 2: We've loaded Cubase's stock Limiter plugin on the snare's channel. An input gain of 10.6dB is pushing the snare into the plug-in, and the signal is capped at the limiter's output gain value - set here to -7dB. This results in a louder, punchier snare. Step 3: Limiters tend to feature relatively fast release times in order to bring the signal back up to its original level as quickly as possible. By lengthening the release time a touch, we're delaying the time it takes for the signal to return to unity. Step 4: It's hard to judge the effectiveness of our previous limiting stages due to level increase. Luckily, many limiters - such as FabFilter's Pro-L - let you link the input and output gain values. A/Bing between the processed and dry signals now exposes only the peak reduction. Step 5: Stacked drum elements can benefit from a touch of overall buss limiting, used to tame clashing transients. Some peak limiters, such as Cubase's Brickwall Limiter, feature a threshold parameter - we've pulled this dial down to achieve around 3.5dB of gain reduction. Step 6: Finally, be aware that several stages of limiting often produce more transparent results. We've removed the previous limiter and spread 3 to 4dB of gain reduction across two different limiters for a less obvious effect - again, keeping in and out gain levels equal.